Lake Granbury Montessori Academy is a non-denominational, independently owned school. This tailored learning environment will be beautiful and challenging program for your child that fosters creativity, interaction, and education. With the assistance of parents and our community, this academy is committed to providing a quality education that will grant the learning tools to stimulate a child's creativity and interest, cultivate their natural desire to learn, and nourish their spirit. 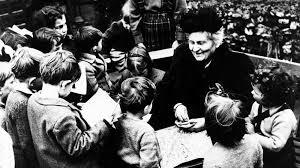 Maria Montessori (1872-1952) was the first woman in Italy to earn a medical degree. Early in her varied and extensive scientific studies she became fascinated with the learning potential of young children. After years of observation and research she formulated her theories of child development and designed specific didactic developmental aids for the children's use. For the rest of her life Dr. Montessori developed methods to educate children to set free their personalities, to liberate their inner life of potentialities, within the context of coherent and unified educational philosophy and curriculum. Dr. Maria Montessori said, “The first 3 years of life the brain and body absorb more information than any other time of life.” It is a time when children effortlessly absorb concepts and habits. It is also a period when the natural repetition of activities develops and maintains neural pathways in the brain which during these first 3 years are the most stable creating the child's learning foundation for life. The primary classroom offers a program that allows for intellectual, social, emotional, and physical development. Montessori primary builds upon the child's knowledge of the present while establishing the foundation for later abstract learning. The primary classroom, through freedom of choice and freedom of movement, allows the child to work independently and explore the environment while building concentration and self-discipline.